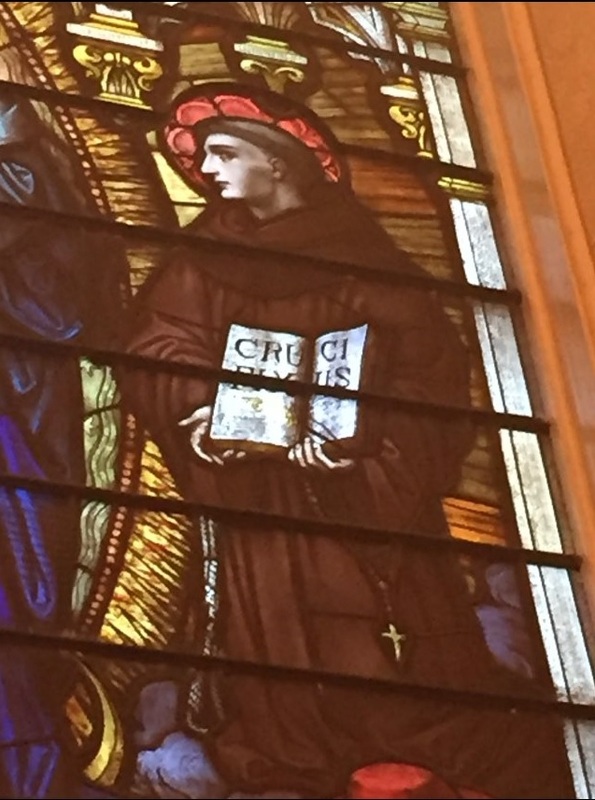 That's St. Bonaventure, of course, to Our Lady's left. You can tell because of his red cardinal's hat, which he has rightly doffed in such heavenly company and deposited on his little cloud. So right away I wanted to know what his book says. You couldn't quite make it out in the photo, though you can tell that it says something. So I asked Fr. Daren to find out, and now he has come back with a closer photo, in which you can see that it says crucifixus. Now I was intrigued. Certainly St. Bonaventure speaks often enough of the crucified, but usually--at least in my memory--in a declined form. I couldn't remember any instance of it in the nominative, as in the book in the picture. But sure enough a little searching surfaced what must be the page of the book Bonaventure is holding open. It's from chapter nine of the Major Legend of St. Francis, on Francis's "ardor of charity and desire for martyrdom." Christus Iesus crucifixus intra suae mentis ubera ut myrrhae fasciculus iugiter morabatur in quem optabat per excessivi amoris incendium totaliter transformari. "Jesus Christ crucified always rested like a bundle of myrrh in the bosom of [St. Francis's] soul, into Whom he longed to be totally transformed through an enkindling of ecstatic love." Today I finished Last Testament: In His Own Words. To be honest, I didn't find it as interesting as Seewald's other interview books, but if you appreciate Benedict XVI very much, as I do, you will enjoy it. Particularly interesting is the material about Joseph Ratzinger's younger life, especially the time around the Second World War.